Welcome to the last round for today! We’re playing 2 more rounds of Swiss tomorrow before cutting to the Top 32. 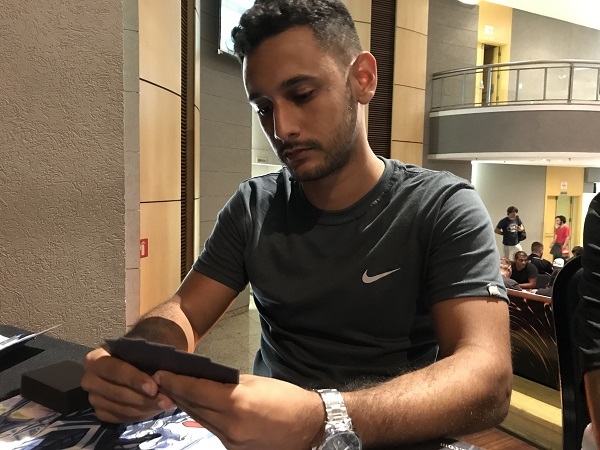 Gabriel Rocha Bernadino from Santana De Panaíba, São Paulo is running Crusadia! I was able to see a few Duelists bring Crusadia with them today and with a 4-2 record, he’s still in contention of making Top 32! 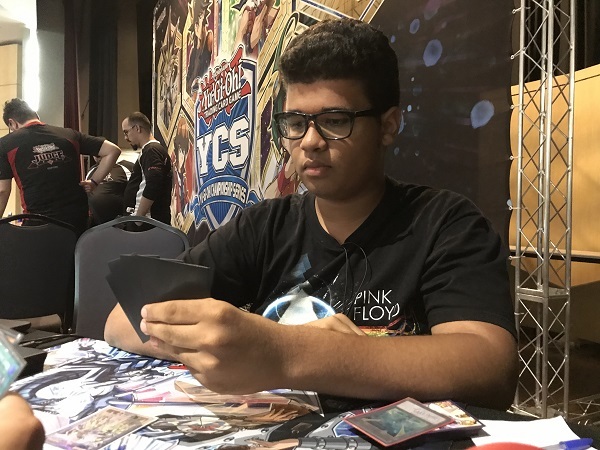 His opponent is Marcos Vinicius Fidelis Chaves from Betim, Minas Gerais with his Gouki Deck. Fidelis Chaves won the roll and elected to go first. He started off with nothing and passed. Bernadino drew for turn and started off Rescue Cat. He used the effect to Special Summon Crusadia Leonis and Valerifawn, Mystical Beast of the Forest. He sent Leonis to the Graveyard to Link Summon Crusadia Magius. Bernadino Special Summoned Crusadia Arboria behind Magius. 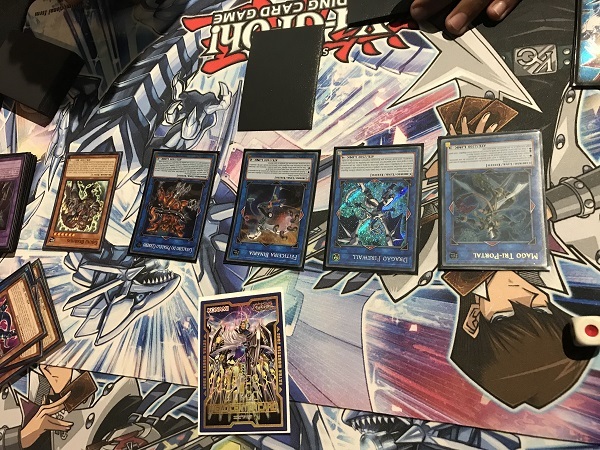 Magius’s effect activated, letting Bernadino add Crusadia Draco to his hand. He used Arboria and Magius to Link Summon Crusadia Regulex. He then Special Summoned Draco behind Regulex and used Regulex’s effect to add Crusadia Power while Draco’s effect let Bernadino add Crusadia Leonis back from his Graveyard to his hand. He then used those Regulex and Draco to Link Summon Crusadia Equimax! Then he used Valerifawn, Mystical Beast of the Forest and Leonis to Synchro Summon Naturia Beast! Bernadino then Special Summoned Crusadia Maximus to the field from his hand and attacked with Equimax and Naturia Beast. He Set 2 cards to the back and passed. 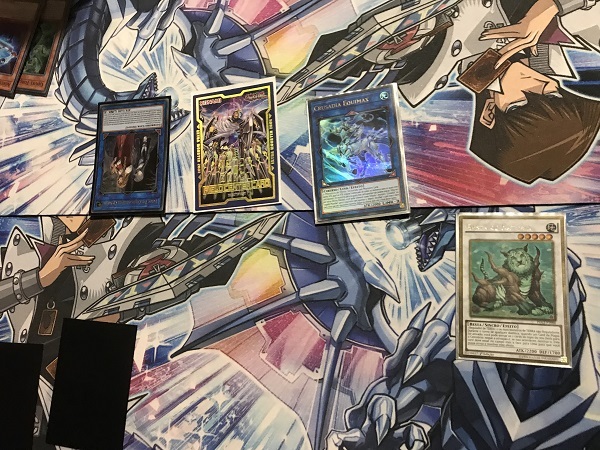 Fidelis Chaves Special Summoned Photon Thrasher and Normal Summoned Gouki Twistcobra. He used the two monsters to Link Summon Isolde, Two Tales of the Noble Knights. Fidelis Chaves attempted to use Twistcobra as Chain Link 1 and Isolde, Two Tales of the Noble Knights as Chain Link 2 but Bernadino Chained Equimax’s effect to negate Isolde, Two Tales of the Noble Knights’s effect and that was enough for Fidelis Chaves. The first Duel was over just like that and we’re going to the second. In Fidelis Chaves’s standby phase, Fidelis Chaves activated The Phantom Knights of Shade Brigandine next to Firewall Dragon. This triggered Gumblar’s effect, forcing both players to randomly discard 2 cards. Too far behind to do anything, Bernadino elected to go to the third and final Duel. Bernadino elected to go first. He started with Leonis which swapped in for Magius. Monster Reborn brought back Leonis from the Graveyard. Magius’s effect added Crusadia Arboria from Deck to hand. The 2 monsters were used to Link Summon Crusadia Regulex. Arboria was Special Summoned next. Regulex’s effect add Crusadia Power from his Deck to his hand. He then Link Summon Equimax, Set Crusadia Power and passed. Fidelis Chaves Tributed P1’s Crusadia Equimax for Gameciel, the Sea Turtle Kaiju. He then activated Sky Striker Mecha – Hornet Drones to Special Summon a Sky Striker Token. He Normal Summoned Gouki Twistcobra and used both to Link Summon Isolde, Two Tales of the Noble Knights. Headbatt and Twistcobra were added from P2’s Deck to his hand. 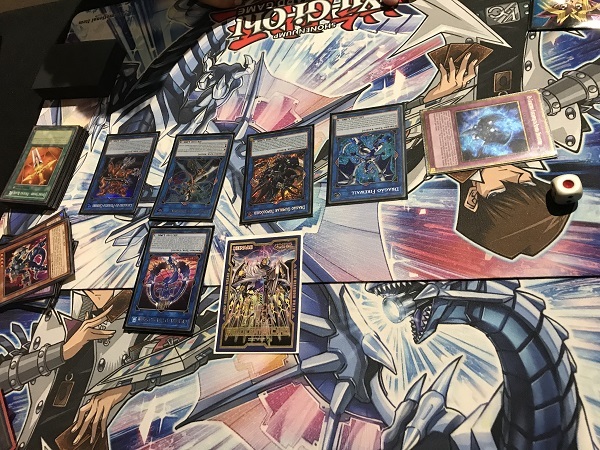 Isolde, Two Tales of the Noble Knights’s other effect sent Divine Sword – Phoenix Blade to the Graveyard to Special Summon Gouki Octostretch from his Deck. Headbatt was Special Summoned next and the 2 monsters were used to Link Summon Knightmare Phoenix. Phoenix’s effect discarded Divine Sword – Phoenix Blade to destroy Bernadino’s Set Crusadia Power. Fidelis Chaves activated Re-Match to Special Summon Octostretch and Headbatt. Those monsters were used to Link Summon Knightmare Cerberus whose effect let Fidelis Chaves discard Book of Eclipse to destroy Gameciel, the Sea Turtle Kaiju. Knightmare Cerberus and Isolde, Two Tales of the Noble Knights were used to Link Summon Firewall Dragon. He brought back the Divine Sword – Phoenix Blade and turned Knightmare Phoenix into Knightmare Mermaid. Suprex and Iblee came out next, and Bernadino’s only chance was that Fidelis Chaves somehow doesn’t put enough damage on the field. Iblee and Suprex turned into Binary Sorceress while Gouki Riscorpio was added to his hand which let Firewall Dragon Summon Octostretch from his hand and a flurry of plays later an Extra Link occurred followed by the final field that ended the match. Marcos Vinicius Fidelis Chaves moves onto Day 2 with a 5-2 record!